A watermark tray is a MUST HAVE tool for any serious classical stamp collector. The paper watermark is often the key feature of a postage stamp, and depending on which type of particular watermark, it can sometimes mean the difference between a common stamp and a rare one. In an attempt to stop contemporary counterfeiting, watermarked paper was almost universally used for printing postage stamps, during the 19th Century and early 20th Century. Today though, watermarked paper is not commonly employed in the production of modern stamps. 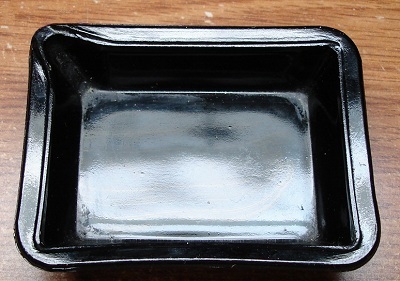 The philatelic watermark trays of today are made of glass or of black plastic, and are relatively cheap. I noticed a number of them in internet searches, for about $1.50 each. In order to reveal the watermark on a stamp placed in your tray, you will need some kind of watermark fluid. 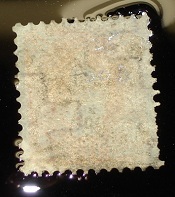 There is a philatelic watermark fluid, specially made for viewing watermarks on stamps, however, it is very expensive, often costing $10 or more for a tiny 3 oz. bottle. If you want to save money, an alternative to buying philatelic watermark fluid is to use lighter fluid. It takes a few seconds longer to evaporate off your stamp than the special fluid does, but the results are the same, and it will not damage the gum on a mint stamp or discolor the stamp in any way. You can get a large bottle of lighter fluid at your local drug store for about $1. The image at left shows a Swiss stamp in fluid. The Swiss Cross watermark embedded in the paper is clearly visible. A word of CAUTION though! Both the philatelic fluid and the lighter fluid are VERY TOXIC, and the lighter fluid is VERY FLAMMABLE! Use them in a large, well ventilated area and away from any sources of heat or flame. You should also NOT INHALE the FUMES for a long period of time. If you have a lot of stamps to test, take frequent breaks, to get away from the smell of the fluid.